The passage that we read from Genesis is one of the more memorable and shocking in the Old Testament. God commands Abraham to sacrifice his only and beloved son. Of course the great dramatic moment culminates when God provides a substitute and the beloved Isaac is spared the knife. 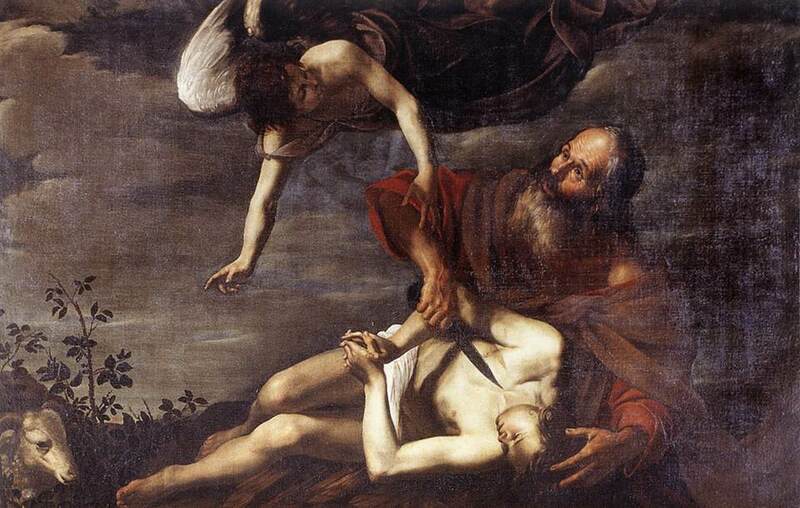 But this “nick of time” rescue does not lesson the shock of God’s demand or the painful image of Abraham standing with knife poised above his son. The commentaries point out that this story, at least on one level, teaches Israel that it shall not engage in human sacrifice. We see God provide the substitute and the precedent for the people to avoid this horrific practice. But is this lesson enough to quiet our discomfort with the actions of God and Abraham? Why demand such a terrifying test? How could Abraham hold a knife to his beloved son? The real shock of the story is the level of faithfulness that God expects from Abraham. The Genesis accounts clearly establish Abraham’s fidelity to the Lord. Abraham leaves his home at advanced age and sets out on a journey into the unknown – all this with only the pledge of the Lord. For all his faults, Abraham proves over and over that he is willing to hear and obey the Lord, and that he worships the Lord. But this demand for faithfulness, the death of his only beloved son - the joy and hope of his old age - this demand goes far beyond any other expression of Abraham’s faithfulness. In this case, he must entrust that which is most precious, more precious even than his own life, to this mysterious Lord. And Abraham does surrender himself entirely to the Lord’s command. There is no boundary, no piece of himself held back from the Lord. Abraham lives in and by the hand of the Lord, abandoning himself to divine providence. This extraordinary gift of faith results not in death, but in life. The Lord reaffirms His promises to Abraham and tells him that his faith is the seed of a nation and the blessing that will one day affect all the nations. For early Christians, still reeling in the aftermath of the events of Jesus’ death and resurrection, the story of the sacrifice of Isaac brought a new understanding of the faithfulness of God. God may have demanded that Abraham sacrifice his beloved son, but God spared Isaac. Paul looks at the death of God’s only and beloved Son and sees the contrast. For all that God asks of Abraham, or of any person of faith, God is willing to give, and has given, more. And so Paul can speak with such awe of the grace of God Who justifies us, not by our offerings, but by an offering of God’s Own Self. In the face of this divine, irrevocable gift our sins and even death itself can have no claim over us. When ancient Rabbis commented on the story we hear from Genesis, they spoke of Isaac as a young man rather than a child. In addition to the faith of Abraham, they saw faith in the actions of Isaac who willingly accompanied his father and trusted God. In their view, Isaac laid down upon the altar of sacrifice and stretched his neck to the blade. Such ideas may have intensified the Christian reading of the passage and the identification of Isaac with Jesus. And the Christians did not fail to notice that Issac carried the "wood" of the sacrifice up the mountain. The passage from Mark relates the experience of the transfiguration of Jesus and the revelation of His glory. In light of the Genesis passage, we should note that Jesus Himself links this event to His destiny to die. His glory is the glory of the Son Who accepts the will of the Father in the garden. His glory is that of the Beloved Who undergoes abandonment, clinging only to His faith in the Father. He is Isaac trusting His Father absolutely and giving Himself freely. The season of Lent is a school of Christian discipleship, and above all, a school of faith. In this season God demands extraordinary faith. We must trust everything we are and have to the God Who loves us. As shocking and difficult as this demand may be, we have the grace of the same God to help us. How can we not trust the One Who gave Himself for us? His grace accompanies us still on our journey making it possible for us to surrender to love.